Fresh from the Farmer’s market, Baby Pink turnips from River Run Farm! Harvested younger than the more common purple-top turnip, they are a delicious variety with a mild and sweet flavor. Baby Pink turnips, Brassica rapa, are members of the Crucifera family. The exterior color of the root is magenta pink while the flesh is variegated with bleeds of translucent white and pink colors, similar to that of a radish. Baby Pink turnips have a unique flavor compared to other turnip varieties. They have a noticeably milder flavor with balanced sweetness and subtle notes of pepper. Though the flesh can be considered tender compared to common larger varieties, it offers a crunchy succulent texture. For this dish, I peeled the Baby Pink turnips, cubed them, then tossed with melted butter and cinnamon and roasted in a 350 degree F. oven for 40 minutes. Fork tender and delicious. Baby Pink turnips are quite versatile. They can be eaten raw, whole or sliced, or featured in crudités and salads. They can be braised, fried, grilled, sautéed and slow roasted. The latter two methods are the most favorable in enhancing the sweetness of the turnip and creating a fork tender texture. 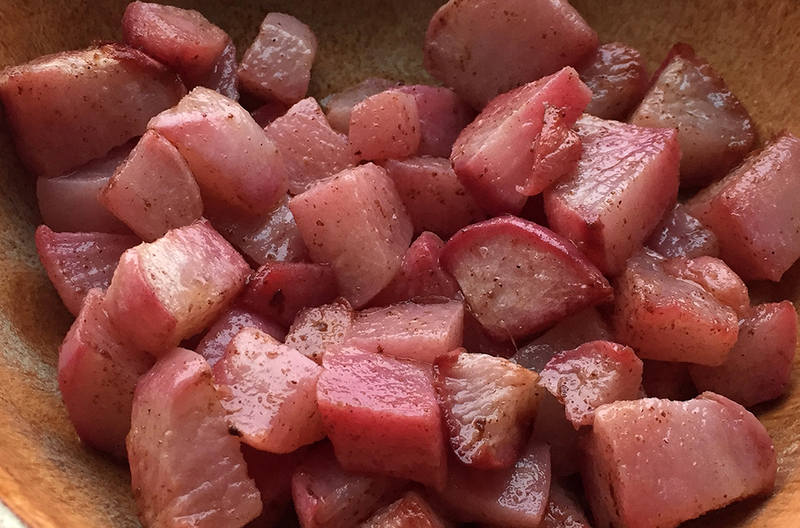 Pink turnips pair well with bacon, beets, butter, citrus, cream, melting and aged cheeses, cider vinegars, garlic, lamb, mint, mustard, pepper, parsnips, paprika, potatoes, sweet potatoes and thyme. Pink turnips can be transformed into purées, soups and gratins. Their leaves can be used as a bitter green in salads. Next trip to the Farmer’s market, I will get more pink turnips and try pickling them.